High availability and disaster recovery are both forms of data backups that are mutually exclusive and inter-related. The difference between them is that HA has a secondary reader database replica (often referred to as stand-by or follower) ready to take over at any moment, but DR just writes to cold storage (in the case of Amazon that’s S3) and has latency in the time for the main database to recover data. Citus Cloud continuously protects the cluster data against hardware failure. To do this we perform backups every twenty-four hours, then stream the write-ahead log (WAL) from PostgreSQL to S3 every 16 MB or 60 seconds, whichever is less. Even without high availability enabled you won’t lose any data. In the event of a complete infrastructure failure we’ll restore your back-up and replay the WAL to the exact moment before your system crashed. In addition to continuous protection which is explained above, high availability is available if your application requires less exposure to downtime. We provision stand-bys if you select high availability at provisioning time. This can be for your primary node, or for your distributed nodes. This means we can restore your database by fetching the base backup and replaying all of the WAL files on a fresh install in the event of hardware failure, data corruption or other failure modes. From reliability perspective, S3 has proven to be up to a thousand times more reliable than EBS and EC2, though a more reasonable range is ten to a hundred times. S3 archives also have the advantage of immediate restoration, even while teams try to figure out what’s going on. Conversely, sometimes EBS volume availability can be down for hours, leaving uncertainty on whether it will completely restore. While Forking means making a copy of the database at the current moment, point-in-time recovery (PITR) means making a copy from a specific moment in the past. PITR acts as a time machine, allowing simple restoration from even the most severe data loss. Similar to forking, PITR creates a copy of your formation and leaves the original unaffected. It uses the same operations internally as forking does: base backups and WAL shipping. This means that performing PITR causes no extra load on the original database. Citus Cloud stores base backups and WAL records for up to ten days, which limits the recovery period to that amount of time. The user interface will prevent you from going back further, and will show the earliest possible recovery time. 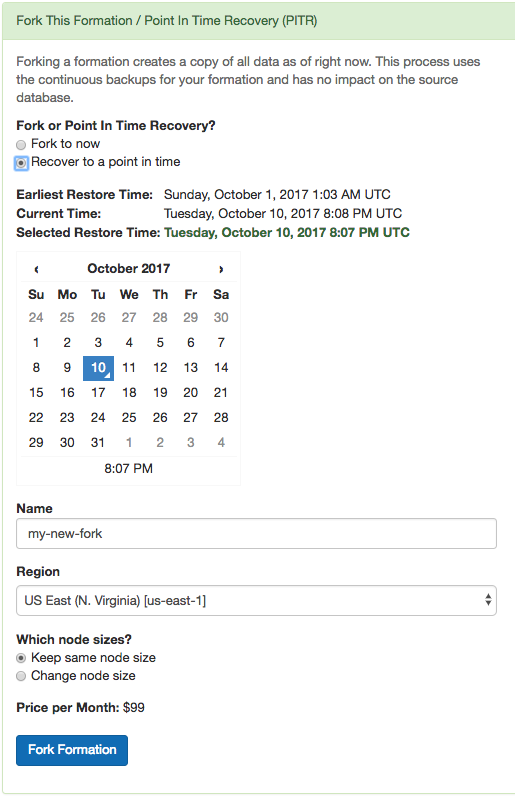 Note that Citus worker nodes have different base backup timings and sizes, so it can happen that one node restores faster than another. In general the recovery process begins with restoring base backups at roughly 30MB/second. When that is complete the Cloud Console will provide a progress meter as it replays transactions from the WAL. The length of time for this stage varies by the number of transactions that must be replayed.